Abdelaziz lourhraz Visual artist Professor of fines arts Agadir .Morocco lives and works in Agadir Morocco. Member of the association blue horizon Morocco. Member of the union artists of the South Morocco professional studies in arts plastics marrakech.Morocco. is now 20 years Abdel Aziz Lourhraz travels the art galleries. From Morocco to Argentina, passing through France, his works have traveled literally as figuratively. At 42, the artist has based much of his career on the study of the human body and especially the woman. Despite the taboo side that can come out, this theme is a way for the artist to question its existence and ephemeral but equally strong and rigid paradoxical physical states, sensitive artist. 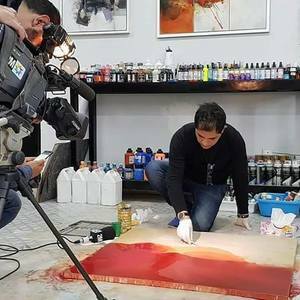 To find his style, Aziz Lourhraz began experimenting all forms of media and mediums, finally settling on the paint. Her art follows her intuition. Me the growling shock of several worlds. For Abdelaziz Lourhraz, the work has an allegorical and fantastic dimension. The painting becomes the pictorial transposition of a complex system of spiritual tensions which, for the artist, are at the base of the universe. A. Lourhraz is currently pursuing a process of purifying the impressions felt in nature: His love for the flowers inspires him an artistic and philosophical harmony, between consciousness and the body. The painter seeks to remove the exterior aesthetic element to retain only the moment of interiority. He is deeply in action by mixing psychically and aesthetically with the material he manipulates. He has to implement the secrets he carries in him. 2017: voices exhibition of both Moroccan and German artists, Bertuchi gallery Tetouan. 2017 : artistic travel through three generations Madrid Spain. 2016 : no limit residency heritage museum Agadir Morocco. 2016: Symposuim Bouznika Rabat Morocco. 2016 38th Moussem of the cultural festival of Assilah. 2016 : Osten biennal of drawing gallery skopje Macedonie . 2016 :Cultural Space Dar Souiri Essaouira morocco. 2015: wandering : exhibition supported by ministry of culture. Gallery Bab Doukala. 2015: gallery thema’s art Casablanca. 2015: nights’ gallery. Gallery Sous soul Agadir. 2015: 2nd exhibition of contemporary art fair Agadir. 2015: the hearts’ gallery Marrakech. 2015: drawing contemporary in house of culture, Khierdinne Tiznit. 2015: Irok Host gallery Netherlands. 2015: Gallery 23 Amsterdam Netherlands. 2014: Gallery Sous soul Agadir Morocco. 2015: installation woman tree night workshop French institution Agadir Morocco. 2013: San Isidro’s museum Buenis Aires province Argentina. 2012: gallery space ten Beunis Aires, Argentina. 2012: IMAGINARIO. Beunis Aires in Argentina. 2011: letters and signs gallery library of mosque Hassan 2 Casablanca. 2010: Dance of colors Amazigh heritage museum Agadir Morocco. 2010: international biennial of abstract art Normandy France . 2010: 11th spring of visual arts Heritage museum of Agadir Morocco. 2010: Orient : land of meeting workshop of Agora Marseille France. 2010: Daniel Vignal gallery Toulouse France. 2010: the competition prize of noble society Rabat. 2009: arts and grafts circles exhibition art fair : la province .france. 2009: workshops Agora Marseille- France. 2008: the national gallery BAB ROUAH Rabat Morocco. 2008: a single space, single dream, theatre Mohammad 5 Rabat. 2008: Rythms and DEKKA festival in Taroudant Morocco. 2008: city museum of agadir Morocco. 2002: Cafe club of the arts, Agadir Morocco. 2002: BAB DOUKALA gallery, Marrakech Morocco. 2000: Contemporary art and inter-culturality , Paris France. 2000: workshop assistant with French embassy and ministry of education. 1998: the decoration art gallery. The winner of the competition of colors and abstraction in France 2009. The winner of the competition of the caterer noble society. The winner of the forum of the arts and the letters Belgique . Second prize of ten space gallery Argentina. Society Noble traiteur Rabat Morocco. Osten museum, skopje gallery Macedonia. 2016: no limit residency in collaboration with Dutch artists’ museum heritage of Agadir. 2016: residency Bouwnika Rabat Morocco. 2016: residency Tahounat, 22 cup Marrakech. The abstract painting express the inside motivation of an artist. Every painting work consists of real experiences. Visual artist always immerses deeper on his works so as to come up esthetical, physical and psychological feelings.